Although several of the Arkansas coaches, including offensive coordinator Jim Chaney, got stuck in the elevator during the entire halftime period and didn’t have a chance to meet with the players, it was the failure of Jim Chaney to stay committed to the running game that resulted in Arkansas losing in the second half of the game. Chaney had to send text messages with his instructions for players to the coaches who were present with them during halftime. As a coach, I understand how important it is to be physically present with your team during halftime, considering you have a chance to make key adjustments. Chaney foolishly decided to abandon the power running game, featuring Arkansas’ huge offensive line, and a power running game that Auburn couldn’t handle in the first half, for a greater focus on passing. 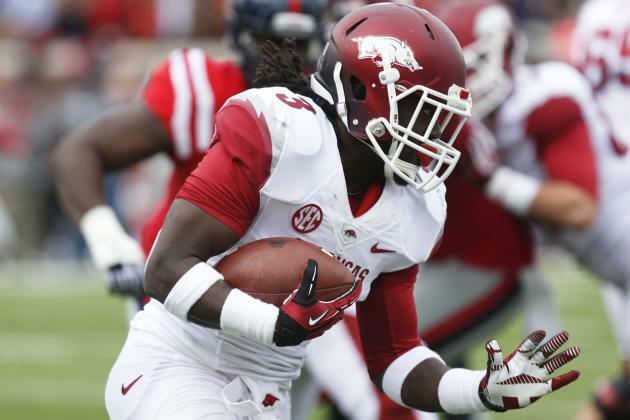 While Arkansas quarterback Brandon Allen had a good game, the strength of the team lies in its great stable of running backs, led by Jonathan Williams, Alex Collins and Korliss Marshall. Arkansas has one of the biggest and most athletic offensive lines in the nation. For Jim Chaney to fail to remain committed to the running game in the second half defies all logic. Yes, Arkansas did run the ball in the second half, but passing the ball so much in the second half resulted in Arkansas not being able to wear down the Auburn defense as it did in the first half. When Jim Chaney decides to neglect the power running game, which made Arkansas head coach Bret Bielema one of the winningest active coaches and such a success at Wisconsin, Bielema must step in and refocus Chaney on the running game. Without question, Arkansas is a much improved team than last year, and the team is going to surprise some teams this year. Arkansas’ coaches, however, must stay true to who the team is, a power running football team; a team designed to play physical on both sides of the ball. The NCAA has determined that Arkansas has the toughest schedule in the country. It will, therefore, be essential for the Arkansas coaching staff to make wise decisions throughout this season. Arkansas has some really great coaches, including Bret Bielema and Randy Shannon, and those coaches will need to evince their great coaching prowess this season to maximize the team’s success and make it to a bowl game.